Awesome issue of Amazing Spider-Man #14, first appearance of the Green Goblin. Perfect to add to your collection! Message or call with any questions or offers. 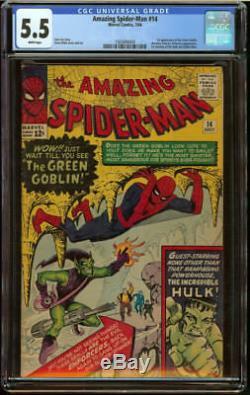 The item "Amazing Spider-Man #14 CGC 5.5 White First appear Green Goblin HUGE SA KEY Hulk" is in sale since Sunday, July 8, 2018. This item is in the category "Collectibles\Comics\Silver Age (1956-69)\Superhero\Spider-Man". 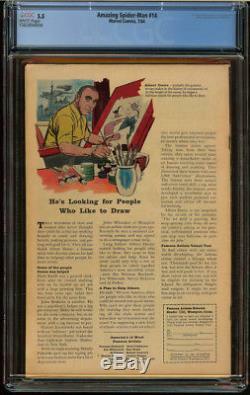 The seller is "columbiacomics" and is located in Columbia, South Carolina. This item can be shipped to United States, Canada, United Kingdom, Denmark, Romania, Slovakia, Bulgaria, Czech republic, Finland, Hungary, Latvia, Lithuania, Malta, Estonia, Australia, Greece, Portugal, Cyprus, Slovenia, Japan, China, Sweden, South Korea, Indonesia, Taiwan, South africa, Thailand, Belgium, France, Hong Kong, Ireland, Netherlands, Poland, Spain, Italy, Germany, Austria, Israel, Mexico, New Zealand, Singapore, Switzerland, Norway, Saudi arabia, Ukraine, United arab emirates, Qatar, Kuwait, Bahrain, Croatia, Malaysia, Brazil, Colombia, Panama, Jamaica.